Well, it’s just me that’s back. There’s no one else here. “We” sounds cooler though so I’m going with it. It’s late February of 2017. We’ve already had one major weather event, as well as a few tornadoes in Texas last night. Things are starting up again and chase season is drawing closer. I’m excited to be heading out in the field for my second chasing year; something I never thought I’d say. It’s not too exciting here in Colorado. In fact it’s supposed to snow on Thursday. It’s been in the 50’s, 60’s and 70’s for the last couple weeks but we’re going to get snow in three days. We probably need it though. Eastern Colorado is a tinderbox and brush fires have been touching off all over the place. Update: The cat just jumped on my desk. The plural works now. WE ARE BACK. This year will change my chasing behavior a little bit. I won’t really have carte blanche to chase everything like last year, but I plan on making the most out it with the chase days I have. I’ve been using the winter season to work on learning landscape photography and video editing, and am now going to refocus on getting better at forecasting. 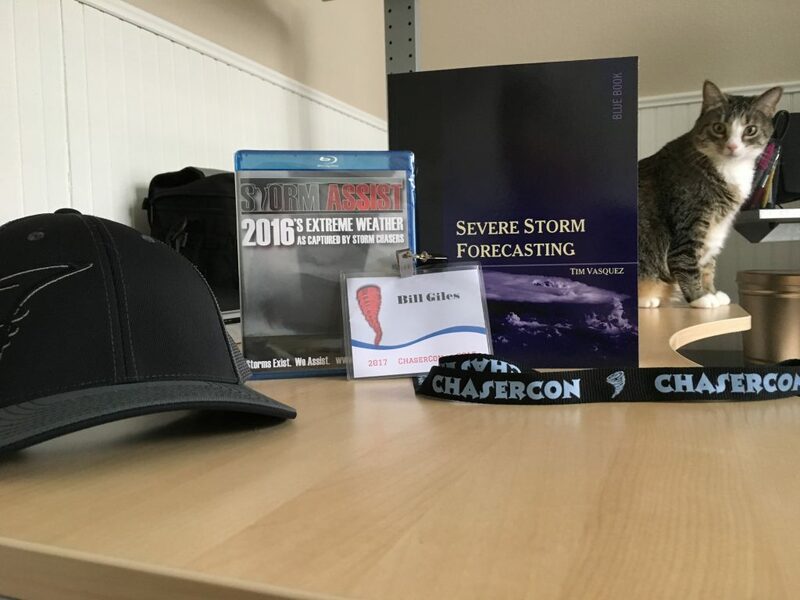 This last weekend I went to Chasercon with Heather and while I was there I picked up Severe Storm Forecasting by Tim Vasquez. A good start. The book is for education. The Blu-ray is for entertainment. The hat is to replace my old hat, which has gone from “old” to “disturbing looking”. The badge is product placement. The cat knocked everything over 3 seconds after the picture. Speaking of video editing, I’m going to start making an occasional video chase log instead of a written post. It won’t be a constant thing; I found that I enjoy writing 1and rewriting, and going back like a month later and rereading my stuff, then becoming self conscious and editing again and it’s good practice for when I don’t become an author later in life. But I’m really interested in video editing right now and I think the occasional video log will be fun as well as good practice. One small problem, I hate the sound of my voice when recorded. Just like everyone else. I’ll try to muddle through it. Maybe I’ll fake an accent. Better initial positioning for timelapses, and more still photography based timelapses instead of just speeding up my video. Of course this might go out the window if a tornado hits the ground and I’m in or near the path but if I can keep rolling safely I’ll stick it out. I want a mothership timelapse like 2016 Leoti, Kansas or 2015 Simla, Colorado! Everyone has one but me and I’m jealous. I have yet to see that sort of structure firsthand. I’m willing to sacrifice proximity to a storm for it, even if there’s a tornado on the ground. Learning daytime lightning photography! I’ll be looking into some neutral density filters so I can get longer daytime exposures for lightning. Failing that, I might try some techniques for grabbing still images from 4K video footage and stacking lightning strike images. I saw a presentation at Chasercon and while I’m not totally sold by the idea, the results were interesting enough to at least try it. More 4K video! This will likely happen later in the chase season, as I will need to upgrade the computer. Right now my processor hates me when I render 4K video and I keep bottoming out on RAM. I also need to replace/upgrade my main storage hard drive soon. The current drive is a little too old and a hard drive crash would make me very sad. I do have a USB backup drive but it’s only a little newer than the storage drive. I need to replace one or both of them. On the subject of 4K video, the reason I want to head down that road is that I can occasionally zoom into my 4K footage when I want to and it still looks amazing, even in 1080p HD. It can give the illusion of a second camera being there which might make a video more interesting. I’m going to upgrade that stupid dashcam if it’s the last thing I do. I am so sick of autofocusing problems! Finally, I resolve to up my “short game”. 2Oh god, a golf analogy. Kill me. That is, once I’ve intercepted my target storm I want to get better at interpreting visual queues and storm structure. I found that I liked chasing closer to the action last year, and I regret not getting closer to the Dodge City supercells until a lot later in their life. I had plenty of time to do it and I just didn’t. Still not chasing into cities though. Nope. I have a few interesting video ideas, one involving a drone. I’m not looking to buy one now (I got stuff to get first), but maybe I can find someone to collaborate with. Speaking of which, I’d like to chase with people this year! I did it twice, once with my girlfriend and once with Tara Kiehn and Jamie Firster. Both trips were a lot of fun. I met a bunch of Colorado based chasers at the convention and hopefully some of us can try chasing together. Bonus points if we don’t want to kill each other afterwards! I’m going to try to do a few more educational posts. I’m working on ideas now. Year two obviously qualify me as an expert and I cam share my vast knowledge 3Just let my life experience serve as a warning to you and others. Don’t try any of this at home. FORECASTING. I want to document my methods and madness. I also need to try forecasting on my non-chase days and see if what I decide verifies (that is, produces a tornado). It’s good practice and I don’t do it enough. Start looking at models further into the future for ideas on possible chase days. Right now I basically still keep to the 3 day SPC product window, and just keep an ear to the ground on social media for further out. I want to be more self sufficient and I think we with that will come a better understanding of my chosen hobby. Stephen Henry 4Go watch this guy’s videos. Seriously. has thoroughly convinced me to buy or build a camera slider, so therefore I’ll commit to this by putting it in the “maybe” list. My resolve is strong. I will see a tornado or many tornadoes. I will eat steak. This is our way and our tradition. I’ll actually use that tent I bought at some point. Ok, we’re done here. The cat won’t lie down again and he’s making it hard to type. Here’s a little something to tide you (and me) over. A couple lenticular clouds and a sunset. Taken on 1/29/2017 at Castlewood Canyon. Bill, where did you get that sweet tornado hat?